This all-suite hotel offers a host of complimentary amenities including Wi-Fi, an airport shuttle, parking, business center services, and hot breakfast. 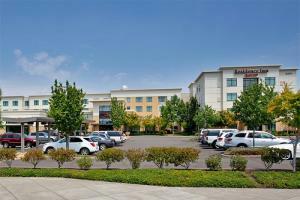 Take the adjacent MAX Light Rail to downtown Portland and the city's popular tourist attractions. 124 comfortable suites offer plenty of room to stretch out, with conveniences including kitchens, living and dining areas, workstations, swivel TVs and modern bathrooms. Take a dip in the indoor saltwater pool, or get your workout at the gym and SportCourt. The Residence Inn Mix offers the opportunity to mingle with light bites by the patio fire pit and BBQ grill, as well as food truck tastings and lobby socials.